OK, OUR FIRST look at the Dell XPS One's stunning display didn’t leave us quite as flabbergasted as astronaut David Bowman staring into the monolith at the end of 2001: A Space Odyssey. But the absolutely gorgeous Samsung PLS panel—with its 2560x1440 native resolution—did leave us a bit slack-jawed. The XPS One’s $2,000 price tag might have contributed to that reaction, too; then again, a 27-inch Samsung Series 9 display built using the same panel costs $1,200 all by itself. The display and a host of other features account for the $500 price difference between the XPS One and the Asus ET2701, but the CPU, GPU, and memory aren't among them. Both machines ship with a Core i7-3770S, an Nvidia GeForce GT 640M, and 8GB of DDR3/1600. Dell and Asus split the benchmark wins, with the Asus taking first place in two of the five benchmarks and the Dell winning in the three others. The XPS One's other features include an integrated TV tuner, a remote control, and a vastly superior wireless keyboard. Dell also bundles facial-recognition software from Sensible Vision that you can use in place of typed passwords to log on to the computer and into websites. Once you've established your credentials—and your face—with the software, the computer will automatically log you out when you move away from the PC, and automatically log you back in when you return. We've seen facial-recognition technology like this before, but it’s never worked this fast. The system routinely logged us in within five seconds of sitting in front of the camera—and it took even less time to log us out when we moved out of the camera’s field of view. The XPS One is the only machine in our roundup to provide USB 3.0 ports, exclusively: two on the left side and four in the back. The rear I/O panel also features both an HDMI input and an HDMI output, so you can run a second monitor. The speakers get plenty loud to compete with environmental background noise, but there's a S/PDIF digital audio output if you want to connect powered speakers that have a DAC. A media card reader, mic input, and headphone output are also on the left-hand side. There's a slot-feed Blu-ray player/ DVD burner on the right-hand side, but it lacks an eject button. That’s aesthetically pleasing, but it's silly to make the user rely on software to eject a disc. The power button is also on the right side, which is the next best place to put it. Asus was the only manufacturer that put the power button in front, where you can see it easily and not accidentally press it while you're repositioning the computer. Dell hits all the right notes with this design: In our book, the XPS One 27 fully justifies its lofty price tag. GATEWAY LISTS no fewer than 13 all-in-one models on its website, and this model with a dual-core CPU, integrated graphics, and twisted-nematic LCD is its top offering. If the PCsin this roundup were playing football, the Gateway would be the water boy. But if all you need in a family PC is a machine forweb browsing, email, productivity, and watching DVDs, this model might serve you well. The ZX6971-UR10P is outfitted with a Core i3-2120, a dual-core Sandy Bridge chip that runs at a respectable clip of 3.3GHz. This is the only contender in the roundup to rely on integrated graphics, but Gateway does provide abundant memory: 6GB of DDR3/1333. As you've probably guessed, the Gateway trailed the field by a wide margin in benchmark results, while 3DMark 11 and Metro 2033 wouldn’t run at all. The Gateway and the Sony have the smallest screens in this roundup (23 and 24 inches, respectively), but they're also the only touchscreen models. The Gateway is an easel-style form factor, with a broad rear foot that slides backward to adjust the angle of the display as you push down on the top of its bezel. There's a media card reader, a mic input, a headphone output, and two USB 3.0 ports on the left side of the machine. One of these ports can charge a USB device, such as a phone or music player. even when the computer is powered off. There’s a tray-mount DVD player/burner (no Blu-ray) on the right side, and there’s a good ol’-fashioned eject button right next to it. You'll find the switch for toggling between PC and HDMI display modes right belowthis, and a second button that toggles an LED that illuminates the Gateway “cow box" logo. 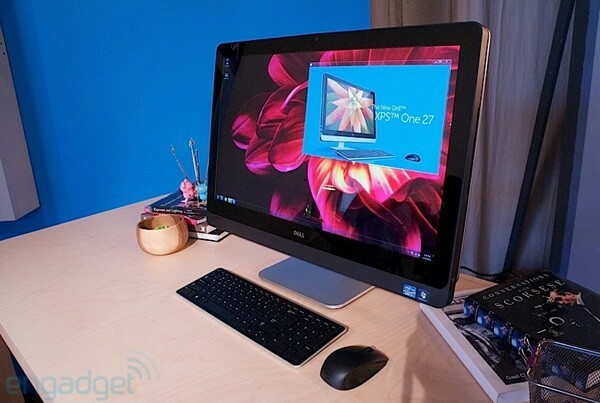 Gateway's ZX6971-UR10P is a very basic touchscreen PC with a price tag that won't induce sticker shock. What you won't find anywhere on the chassis is a freakin' volume control! You can use the keyboard or the mouse to adjust the volume in PC mode, but you get a fixed level when you’re using the HDMI input and the display alone. Compounding the problem is an onboard amplifier that’s so anemic we had to connect a pair of self-powered speakers to the computerwhen we plugged our satellite TV set-top box into its rear-panel HDMI input. On the bright side, you don’t need to fire up the entire PC just to use the monitor. Gateway’s Touch Portal is a suite of apps optimized for a touchscreen, including a web browser, a music player, a video player, a slide-show program, a web camera utility, and a copy of Cooliris. Gateway also provides a very cool remote control. There's a basic Media Center remote on one side; flip it over, and you get a miniature QWERTY keyboard very much like the one that D-Link ships with its Boxee Box. Unfortunately, the remote has no control over the volume when you’re using only the HDMI input. The Gateway ZX6971-UR10P isn't the most exciting all-in-one we’ve laid hands on, but it's priced right.